Aces High Cuff Link Set They are complete in there own prestntation Box The Cufflinks have the Units four aces with all four suits on them. 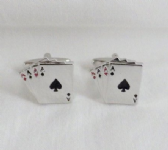 The cuff links size is approx 20mm X 18mm Made from Metal with a polished sliver colour finish and the aces are finshed in red and black Great gift for poker or any card players Picture is Example Only If you have any questions please do not hesitate to contact us. Supermarine Spitfire Cuff Link Set They are complete in there own prestntation Box The Cufflinks have a 3D Spitfire on them. The cuff links size is approx 20mm X 18mm Made from Metal with a polished sliver colour finish and the Spitfires have the RAF Ensign on them hand painted Great gift for poker or any card players Picture is Example Only If you have any questions please do not hesitate to contact us. Unlce Alberts Cuff Links Official Alchemy licensed A pair of pewter cuff links of a Victorian pocket watch with a printed and enamelled 13-hour watch face; with swivel bar fittings. The perfect, miniature 13-hour Lunar-time, Victorian era fob watch, inscribed with 'Hora Morti' - the 'Hour of Death'. Dimensions (approx. ): H: 25mm (0.98") W: 22mm (0.87") D: 32mm (1.26") Designed and hand made in England in fine English pewter. (Lead, cadmium & nickel compliant) Great gift and nice looking piece Picture is Example Only If you have any questions please do not hesitate to contact us. Union Jack Cuff Link Set They are complete in there own presentation Box The Cuff Links have shinny Union Jack on them. The cuff links size is approx 20mm X 15mm Made from Metal with a polished sliver colour finish and the Union Jack on the front Great gift Picture is Example Only If you have any questions please do not hesitate to contact us. Welsh Dragon Cuff Links Set They are complete in there own presentation Box The Badge size is approx 1.5cm X 2cm Made from Metal with a gold colour finish and the badge finished in full colour. 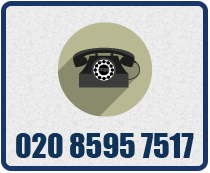 Picture is Example Only If you have any questions please do not hesitate to contact us.